Window Splash advertising is not just limited to storefronts. 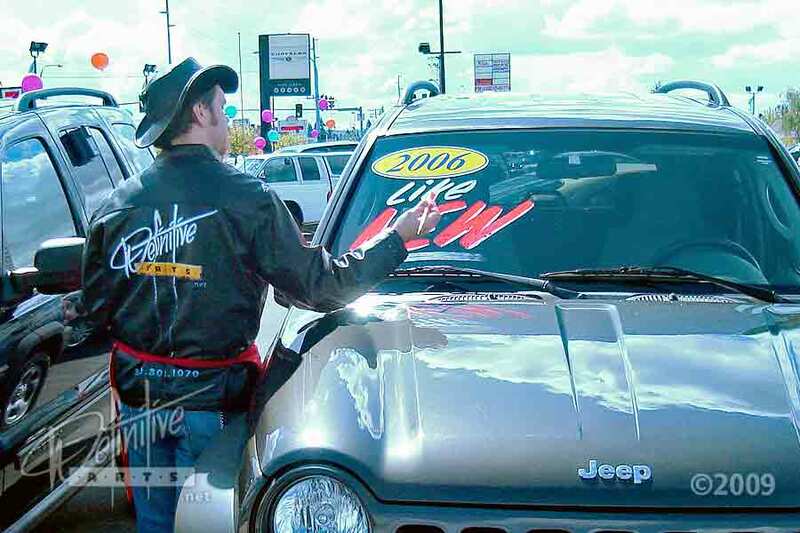 It is a great way to advertise your sales and specials on autos & RVs as well. Nothing makes a front showline stand out more than customized 'Windshield' Splashes. You'll not only be able to post sales prices but showcase all the special features. Using the same quality paints as our Advertising & Holiday Window Splashes, you'll be sured to get the most out of your splash. Easy removal & cleanup make changing out or detailing the unit once the sale is done quick and simple. Car lots, big & small, RV lots or trade shows, or even just a special event, Definitive Arts is ready to come and serve you.